As I approached the sixth month anniversary of my return to India, I realized that I hadn't taken a proper vacation yet. I had patiently survived four months of summer and monsoon rains in Mumbai but I had just about had it with the chaos and crowds here. I needed a break, somewhere serene and calming, with fresh air that didn't smell like yesterday's exhaust and garbage. Yep, that's what Mumbai smells like most of the time when it does not rain. I was pondering on my vacation choices in India, which looked rather limited given the onset of monsoons here. Then inspiration came to me in the form of a TV newsfeature about the re-opening of the strategic Nathula Pass. Nathula is the ancient Himalayan gateway into India from Tibet (now part of China ) on the Silk Road trade route. It had been closed since the 1962 war between India and China and had recently been re-opened to facilitate trade between the two nations. At 14,420 feet, the Nathula pass in the border state of Sikkim has one of the highest motorized roadway in the world and also one of the highest ATM location (UTI bank) at about 13,000 feet. 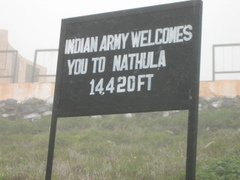 I learnt that I would need to get a permit from the Indian army before I could get there since Nathula is a highly strategic border location. However, I was told that it's not very difficult to get one. As a back-up I resolved to visit the Himalayan kingdown of Bhutan, if the Nathula trip ran into any permit hurdles. I began my travel planning by making phone calls to the college alumni network to locate anyone I may know in the area. It turned out that one of my college buddies was now based in Darjeeling as the S.P. (Superintendent of Police) of the area. It had been a while (15 years to be precise) since I had seen him. The S.P. had been a student of St. Stephens college at Delhi Univeristy while I was at the neighboring Shriram College of Commerce. I had a high school friend who was also at Stephens those days and that's how I knew him at college. I remebered him as a mischevious prankster in college and I wondered if he had changed with authority and adulthood. I sent feelers to him through the high school friend that I wanted to see him and visit Darjeeling. He was delighted to hear I am back in the country and invited us both to visit him as soon as possible. I accepted the invitation happily and planned my trip for late August. Hey! I notice you say that the Nathula pass is the highest motorized pass in the world. Last summer I drove through Changla Pass (about 4 hours outside of Ladakh) -- it's at 17,800 feet, and one of the soldiers stationed there told me it was the *second* highest pass in the world. Which raises the question: which is the highest? And was he even telling the truth about Changla? Thanks for the correction. I went by local claims as well on Nathula's status as the highest motorized pass in the world. On further research, it turns out that Changla is the highest motorized pass in India, Tanglangla is the second highest and to be honest now, I am not sure of Nathula's ranking. Are you sure Changla's the highest? I thought there was some other pass, on the road from Manali to Leh, that beat it. Ah well, who knows. They're all breathtaking!